Lee Johnston is coming into the new season free from injury after some big spills over the past few years. Fermanagh’s Lee Johnston is confident he has put everything in place to allow him to challenge for more international road racing victories in 2019. Johnston joined Honda Racing last year alongside Ian Hutchinson and although he finished on the podium in the feature North West 200 Superbike race on the Fireblade SP2, his results were not what he expected at the Isle of Man TT. Fermanagh rider Lee Johnston will ride BMW and Yamaha machinery under the Ashcourt Racing banner, plus a KMR Kawasaki at the Isle of Man TT. The 30-year-old claimed rostrum finishes in the Supersport class at the North West and Ulster Grand Prix, but ultimately the former British Superstock 600 champion was left slightly underwhelmed at the end of the season. Now, Johnston is hoping to recapture his exceptional form from 2015, when he won the Superstock race at the North West 200, finished on the podium in third place in the class at the TT and powered to a treble at the Ulster Grand Prix, winning both Supersport races and the Superstock event. He will ride BMW S1000RR and Yamaha R6 machinery under the banner of his new-look Ashcourt Racing team and also has support from loyal backers East Coast and Burdens. 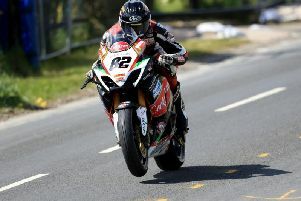 Johnston, who will ride a Kawasaki Supertwin for Ryan Farquhar at the TT, said: “I’m going into the season with the attitude that I’ve done all I can over the winter and the bikes will be prepared as best they can. “In my head mentally I know that I’m in the exact same position I was when I did a lot of winning in 2015. Fundamentally, if you put in all the same ingredients you should get the same out of it at the end. “I feel good at the minute, my confidence is good on the bike and having a year behind me where I didn’t have any injuries is very important as well,” he added. “It takes time to get over these big injuries so thankfully I’m coming into this season feeling great physically. Johnston will also compete in the British Supersport Championship this season as part of his preparations for the major international road races.